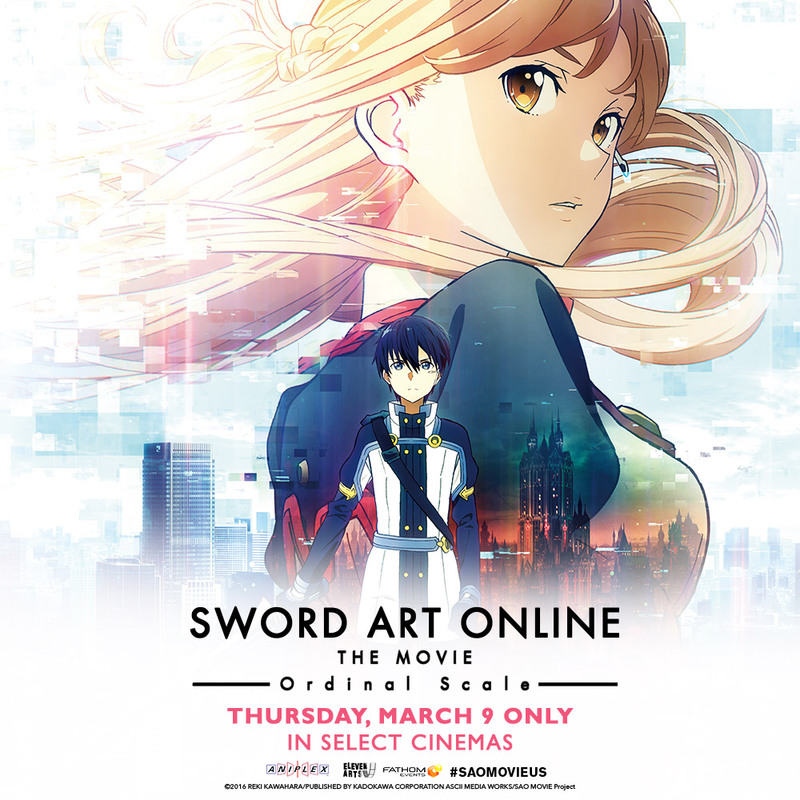 See Sword Art Online The Movie: Ordinal Scale in Theaters for FREE! First it was a light novel. Then came the manga, the TV series, and the video games. Now, it’s a movie—Sword Art Online The Movie: Ordinal Scale opened in Japan on February 18, 2017! On March 9, it’s coming to US theaters for one night only by way of Fathom Events, and what kind of geeks would we be if we didn’t give you the chance to see it for free? Experience an all-new adventure with Kirito, Asuna, and their party members as they explore the world of Ordinal Scale, a new hit game utilizing augmented reality technology. Players are about to find the line between the virtual world and reality beginning to blur and their worst nightmares coming true . . . As his fellow players find themselves in danger, the hero is called upon once again—can Kirito save his friends, or is this going to be game over for him . . .? To enter, just follow @TwinCitiesGeeks on Twitter and tweet at us by 12:00 p.m. Central on Friday, March 3, telling us why you want to see the movie. We’ll choose 3 random winners to each receive 2 tickets to this limited showing! No purchase necessary. Total number of prizes to be given away is 3, each consisting of 2 tickets. Retail value of each pair of tickets is $34. Any other expenses incurred as a result of winning this prize, including taxes, are the sole responsibility of the winner. Prize fulfillment by Allied Integrated Marketing. How to Enter: Follow Twin Cities Geek on Twitter (https://twitter.com/TwinCitiesGeeks) and mention @TwinCitiesGeeks in a tweet telling us why you want to see Sword Art Online The Movie. Only one tweet from each Twitter account will be counted. Selection and Notification of Winner: Each eligible entry will be assigned a number in ascending order based on the order in which the tweets were posted. A number will then be chosen by means of a random number generator, and the user who posted the comment corresponding to that number will be deemed the winner. Odds of winning are dependent on the number of entries received. Eligibility: One entry per person. Giveaway is open only to legal residents of Minnesota who are 18 years of age or older at time of entry. Void where prohibited by law. In order for an entry to be counted, the tweet must be posted by 12:00 p.m. Central time on March 3, 2017; the tweet must follow the giveaway prompt; and the account posting the tweet must be following @TwinCitiesGeeks. Current Twin Cities Geek contributors and editors are not eligible for entry.